The sixth season of the American science fiction television series Star Trek: The Next Generation commenced airing in broadcast syndication in the United States on September 21, 1992, and concluded on June 21, 1993, after airing 26 episodes. Set in the 24th century, the series follows the adventures of the crew of the Starfleet starship Enterprise-D. The season begins with the successful rescue of Data from the nineteenth century, and we learn just how long Guinan has actually known Picard. Picard is temporarily assigned away from the Enterprise for a dangerous espionage mission against the Cardassians, but is captured and subjected to torture, nearly succumbing before being released. Deanna Troi engaged in a similarly risky mission of espionage against the Romulans. Picard also underwent significant personal development during this season. He formed an intense and troubled romantic relationship with the Enterprise's head of stellar cartography, Nella Daren. After his artificial heart is nearly destroyed, Q helps Picard experience a vision of the unremarkable life he could have led, giving him a better understanding of his mortality and his reasons for living. Riker also experiences a deeply personal conflict, making a gripping personal battle with his own sanity, and later discovers an accidental transporter-copy of himself that had been abandoned on a desolate planet for nearly a decade. Several well-known recurring characters make appearances this season, the most famous among them being Montgomery Scott. The Enterprise engineer from the Original Series is discovered alive, and after an awkward period adjusting to the twenty-fourth century, sets out to explore the galaxy on his own. The sentient hologram Professor Moriarty returns, holding the ship captive in a complex game that he hopes will grant him freedom to live outside the holodeck. Reginald Barclay continues to develop, overcoming his fear of transporters. Q, in addition to his appearance in Picard's counterfactual vision, returns earlier in the season. We are left with the rediscovery of Lore, leading a group of rogue Borg, who with the influence of an emotional stimulant for androids, successfully seduced Data to become a willing participant in his violent plans in the cliffhanger that ends the season. The Enterprise crew follow Data to San Francisco of the 1890s. The crew deals with Samuel Clemens and runs into Jack London while trying to find a way to prevent aliens from interfering with 19th century Earth. Guest star: Jerry Hardin as Samuel Clemens. Barclay must overcome his fear of the transporter to solve a mystery. A psychic ambassador uses Deanna's mind to influence the outcome of his mission. Several members of the crew are abducted and experimented on while they sleep, including Riker, Worf, La Forge and Data, and become sleep deprived. Q reveals a secret about a young woman from Kansas who is visiting the Enterprise. She is a Q, and so were her parents. She also displays power far greater than Q himself. Guest stars: Olivia d'Abo as Amanda Rogers, and John de Lancie as Q. A transporter malfunction turns Picard, Keiko, Ro and Guinan into children who become the ship's only hope when they are left aboard while the adult crew are forced to perform dangerous labor by Ferengi pirates. Data's mind is connected to the ship's computer which creates unforeseen effects on the holodeck. Data observes that mining tools have become sentient beings and fights for their preservation. To save Captain Picard, the tools must be put in harm's way. Data refuses to allow this since it is unacceptable to kill one sentient being to save another. One of these tools decides to give its own life to save the others. Based upon material by L.J. Scott. Captain Jellico is assigned command of the Enterprise while Picard is sent on a covert mission into Cardassian territory. Guest star: Ronny Cox as Edward Jellico. Picard, having been captured, is tortured by a sadistic Cardassian interrogator (played by David Warner). Barclay accidentally awakens Professor Moriarty on the holodeck who uses the powers at his disposal to coerce the crew into finding a way to allow him to leave the holodeck. Guest star: Daniel Davis as Professor Moriarty. Geordi falls for an alien Starfleet officer who is suspected of murder. Guest star Renée Jones as Aquiel Uhnari. Deanna is involuntarily recruited to assist in the transport of Romulan defectors across the border. An accident kills Picard. He finds an afterlife with Q analyzing his past choices. Worf is told on Deep Space Nine that his father is alive and is being held prisoner by the Romulans. Meanwhile an engineering experiment accidentally results in Data's first dream. Guest star: James Cromwell as Jaglom Shrek. Worf, now a prisoner, tries to teach the Klingon refugees the ways of the warrior. Thieves attempt to steal trilithium from the Enterprise during a Baryon sweep at the Remmler Array and Picard alone must thwart them. Picard becomes involved with a woman who is serving on the Enterprise but he must send her into a dangerous mission. Picard tries to solve an ancient genetic mystery uncovered by his archaeological mentor and faces stiff competition. Guest star: Norman Lloyd as Richard Galen. Riker finds himself prisoner in an alien mental institution which resembles scenes from Beverly's play. Dr. Crusher risks her career to solve the murder of Ferengi scientist Dr. Reyga and vindicate his research. Worf experiences a crisis of faith and travels to a Klingon holy site where the mythic figure Kahless returns to lead the Klingon people. Riker encounters a duplicate of himself, Thomas Riker, created by a transporter malfunction. Thomas vies for Deanna's affections. The Enterprise is caught in temporal stasis and on the brink of destruction by a Romulan Warbird. The crew encounter a group of Borg acting individually and Data briefly experiences emotions. Professor Stephen Hawking makes a guest appearance. 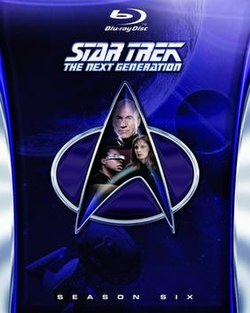 In 2019, CBR rated Season 6 of Star Trek: The Next Generation as the 5th best season of all Star Trek seasons up to that time. ^ a b c d e f g h i j k l m n o p q r s t u v w x y z "Star Trek: The Next Generation Nielsen Ratings – Seasons 5–6". TrekNation. Archived from the original on October 5, 2000. Retrieved December 22, 2013. This page was last edited on 22 April 2019, at 12:36 (UTC).